A classic dish cooked in garlic,tomatoes,Mama Sita's Oyster sauce and Mama Sita's Coco Floral Sap vinegar. 1. 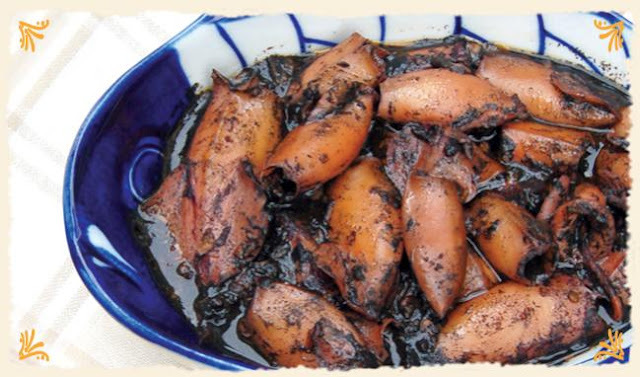 Combine the squid, Mama Sita's Coconut Floral Sap Vinegar, and sugar. Set aside. 2. In a stainless steel saucepan, heat oil and saute ginger, garlic, onion and tomatoes. As the onions and tomatoes wilt, add the squid mixed with Mama Sita's Coconut Floral Sap Vinegar, and sugar. 3. Add Mama Sita's Oyster Sauce, water with squid ink and squid mixture. Bring to a boil and simmer for 5 minutes or until tender. Season with salt.